A few days ago, Sharron Angle launched a new format to her website, giving the campaign a more professional looking web portal. Harry Reid’s campaign, however, took the code from the prior Angle website and launched a website called “TheRealSharronAngle.com.” The fake website was what, in internet terminology, is called spoofing, where a seemingly real website is created, usually to obtain information under false pretenses (frequently referred to as “phishing”). The purported purpose of the spoofed website — according to a press release by the Reid campaign — was to preserve Angle’s position statements on various issues — but that purpose surely was contrived, since Angle’s prior website was cited and quoted extensively. All of Angle’s positions, as reflected on the original website, were fully preserved. There even was a controversy back in June when the “issues” section of Angle’s original website momentarily disappeared as the website was being revamped, and there were plenty of screen shots and other information preserved from the original website. For example, in early June a reporter easily recovered old Angle web pages from Google Cache. There simply would be no legitimate reason for the Reid campaign to create a spoofed Angle website if what it merely wanted to do was preserve Angle’s policy positions. 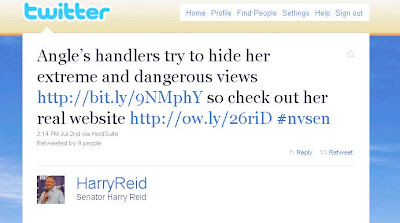 While creating a spoofed website may have reflected the childish ways of the Reid campaign, the way the Reid campaign set up the spoofed website was more nefarious. The Reid campaign activated the prior sections of Angle’s original website where supporters of Angle could enter their e-mail and other contact information for future campaign communications, as well as a form to sign up as a volunteer. I know that the “contact” section was operable because I filled it out the form and hit the “submit” button. Turning these contact and volunteer functions live must have been a deliberate Reid campaign decision, because the “contribute” function on the spoofed website was inoperable. The Reid campaign clearly wanted to gather names and contact information on Angle supporters, but did not want to go so far as to take fraudulent donations. Since the website was titled “The Real Sharron Angle” and looked like Angle’s original website, it is likely that some people would have thought it was the real Sharron Angle website, and would provided private information under false pretenses if the fake website had continued. In addition, it appears that the only interactive function on the fake site is the capturing of names of persons seeking to add their names and email addresses as supporters of Sharron Angle. Surely the Reid campaign is not planning to obtain the names and email addresses of Angle supporters under false pretenses and the to misuse those names and email addresses for some purposes other than the purposes for which the individual signors intended! But the reality is that by creating a spoofed website with the contact and volunteer functions operable, the Reid campaign sought to obtain personally identifiable information about Angle supporters. At a minimum, such information about Angle supporters would have been gathered under false pretenses. The phishing function also would have been disruptive to the Angle campaign because people who thought they had volunteered for the Angle campaign never would have been contacted to help out because they had, in fact, been tricked. Regardless of whether the Reid campaign’s spoofing and phishing attempt was criminal, it was sleazy. Harry Reid needs to explain why his campaign engages in such tactics. Perhaps after he explains why he refuses to debate Sharron Angle for several months. Most of the web forms used on web pages, like volunteer signups, merely generate an email to a pre-programmed address. Unless Reid actually changed that email address, there is no phishing – the email went wherever it went on the old site. The donate link, on the other hand, would go to an *external* SSL-secured (https) site, and if they left it live, it would take you to Angle's *real* donation site. In short, this is not phishing. It is merely highlighting Sharon Angle's views that she herself apparently thinks aren't quite ready for prime time. I'm sorry but how is this not criminal? Isn't this akin to identity theft? They pretended to be someone they were not in order to obtain information under false pretenses. How is this not a crime? I hope Harry Reid goes down in flames so hot that he thinks hell has reached up and burned his backside. Also, it may not be a crime, Uber, but it certainly is Chicago-style dirty politics as usual. Reid has to go. How is it "dirty politics" to post the candidate's own words? It’s dirty politics to repost an entire web site in a way that makes it look like the current web site, when it does not reflect current events. It’s dirty politics to include a contact form on that site so that people who think they’re requesting information from the candidate are just being ignored (at best) or are sending their contact information to a phisher (more likely). Most web forms do not “merely generate an email”. They go through backend code to store information in a database. For the form to work without going to Sharron Angle’s real web site, the Reid team had to deliberately connect the form to some backend code, either to ignore the submissions or hijack them. The Case of the Crossdressing Congressman.